From time to time you might want to strip clean your bearings. My skates were about a year old before I did this. Whilst there was some muck in them I can’t say that I’d have noticed if I hadn’t looked; my skates rolled just fine. At the time I had been skating weekly indoors and extensively outside, including the 38km roll around Berlin. 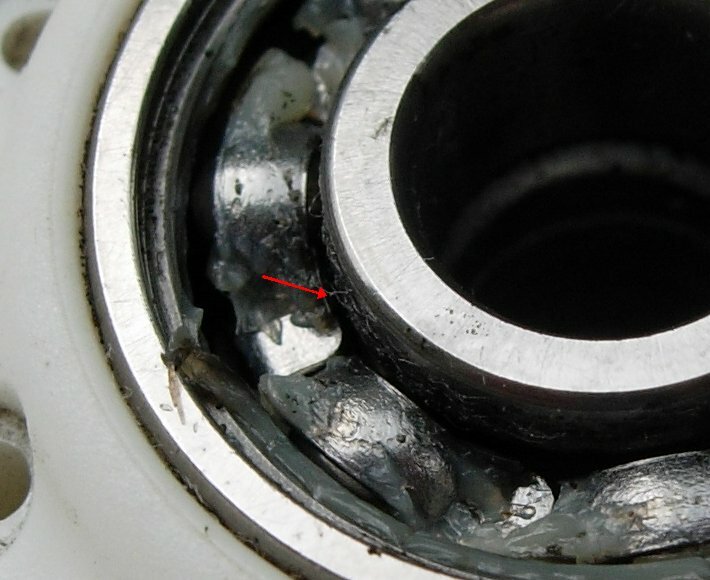 Take the wheels out of the skates and clean away any muck before removing the bearing shield. 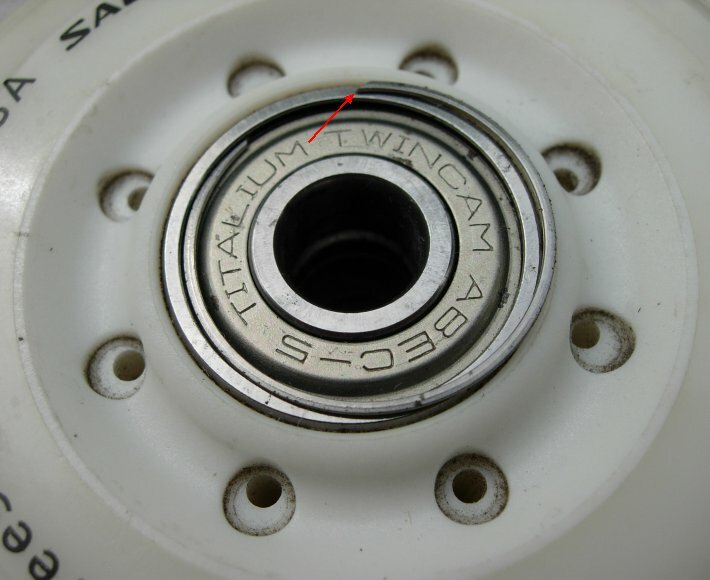 The shield in this image is the part that says “TITALIUM TWINCAM ABEC-5”. 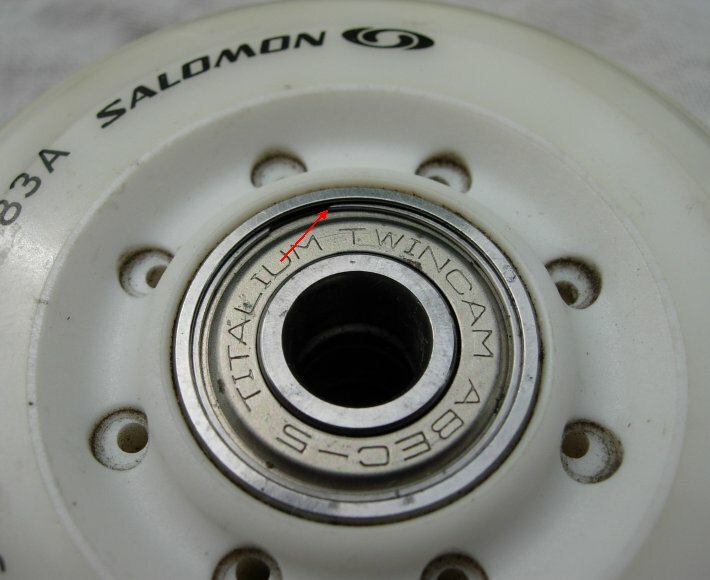 It is a thin metal ring, held in place by a C-ring, one end of which is indicated by the red arrow. This is a sprung split ring that sits in a groove around the inside of the bearing casing. On close inspection you will see that the C-ring is cut diagonally. One end can easily be removed by poking a pin behind it and levering it out of the groove. This image shows the C-ring partially displaced from the groove. You can more clearly see the diagonal cut in the ring too. Once the C ring is out this far it easily slides out. The pin can also be used to poke the shield out too. The last of these images shows the bearing with the the shield removed. You can now see the bearing cage and ball bearings. The arrow indicates the build up of muck on the inside race. This can be removed with the pin you used to open up the bearing. You can now lubricate the bearings too. Use a skate bearing oil, available from skate suppliers and sometimes also supplied with new bearings. You can see that these bearings are greased, the trend now is to use oil. Re-assembly is the reverse procedure. Place the shield back on and slip the C ring back into place, starting with one end and working around to the other. It will click back into the groove once aligned. That’s the lazy way to do a strip clean. One time I removed the bearings, stripped them down and cleaned them in a jar of methylated spirits. They then need re-oiling before reassembly. To be fair I didn’t notice any difference after I’d done that, so it’s not something I bother with very often.